White lab coats, carefully inscribed notebooks, pristine labs, and walls festooned with giant monitors displaying psychedelically colored images of the living brain. The scribbling needles of EEG graphs. We all know what we want neuroscience to look like. But how does it feel? 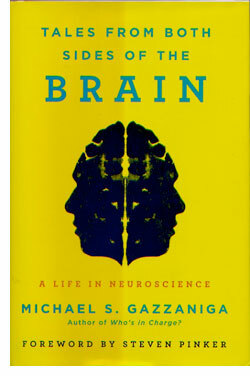 Dr. Michael Gazzaniga, a living legend of neuroscience, tells us exactly how it feels to do science in 'Tales from Both Sides of the Brain: A Life in Neuroscience.' The bottom line; social, — human. Gazzaniga is best known for the "split brain" experiments that he conducted as a grad student at Cal Tech, and the lifetime of thinking and science that followed this auspicious beginning. In this book, he takes us back to those years, and uses his skills as a writer of science to write about the scientific process as he has experienced it in his life and career. The result is a book that engages the reader on a variety of levels. It's utterly engrossing and authentically mind-boggling. The book starts in 1960, when Gazzaniga was an undergraduate at Dartmouth. It was a Wellesley girl that in part inspired his move to Cal Tech. Summer in California, what more could you ask? Certainly not the career and experiences that follow in this book, which is filled with walk-ons by our most famous scientists, who are joined by politicians and entertainers. Again and again, even as he makes discoveries that re-make our idea of human consciousness, Gazzaniga emphasizes that science is a social process. Weaving science and memoir into a seamless whole, 'Tales from Both Sides of the Brain' lives up to its title both actually and metaphorically. Gazzaniga nails the stunning moments of discovery in his career with friendly prose. He in fact befriends the reader, never talking down to us, but always ensuring that we can grasp both the import of what he discovered as well as the wonder he experienced in the process. If you want to learn the history of neuroscience, you've come to the right book. But beyond the science, there's an incredible cast of characters, and a bildungsroman plot arc that unfolds showing how Gazzaniga's social life fed into his science and the science created his social life, in a feedback loop that is all about the way science gets done. Science is not an abstract here; it's a social, human process. Thus we get Roger Sperry and David Premack matched with William F. Buckley, Jr, Steve Allen and even Groucho Marx. There are many moments in this book which will raise the hair on the back of your neck with the eerie power of Gazzaniga's life and insights. The hardcover includes lots of photographs, and is truly enjoyable to read. That said, I also bought the "Enhanced Edition" in iBooks, which was actually less expensive than the regular version. It is a fantastic addition to the hardcopy, as it includes many of the most startling videos that Gazzaniga himself made with the cutting edge technology of the day, a Bolex 16 MM camera. Seeing the split-brain subjects in action, in Gazzaniga's intricately logical experiments is a powerful appendix to the reading experience itself. I suppose it should come as no surprise that Michael Gazzaniga is able to make use of today's cutting edge technology with such ease. He's still changing the world, one word at a time. 'Tales from Both Sides of the Brain: A Life in Neuroscience' is a powerful demonstration of just how social all science is, within the story it tells and in the part it plays in the lives of those who read it.